Blog from Hong Kong, Hong Kong | A head above the rest! So on Sunday I decided to go out and explore the city by myself. 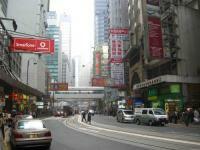 I took a double-decker bus to Central and was then going to just walk around all afternoon and explore. And that is exactly what I did. Once I got off the bus at what I was hoping was Central I began walking; the buses have scheduled stops, but they do not tell you where you are so you have to have a good idea of where you are going. My goal was to buy sandals, a bookbag and some sort of guide book because I left my other one in Kansas. I found a bookstore, but unfortunately all of the books were written in Chinese so I left. Next I found a little shop that sold shoes and flip-flops. I found a blue pair for only HKD$12, or US$1.50; however the largest size they had was 11.5, but I bought them anyway seeing as how I am only using them to go to the bathroom and shower room. After about an hour or two I found a little shop that sold all different types of bags. I found a great bookbag for only HKD$99, or US$12.70; in the states this bookbag would sell for at least $35. After another hour I finally found a bookstore that carried books written in English and a great guide book inside; this book was the most expensive out of all of the items I bought, HKD$150, or US$19. By this time I had been walking for a solid 3 hours or so. Feeling a little tired I decided to head back to the dorm. I noticed on the bus sign that my dorm was only 5 stops away so I decided to just walk home. Bad idea, it took me another hour to walk home and it was all uphill. All in all it was a great afternoon because I was able to see a lot of Central.